Paper Girls is so good you want to recommend it to others, but you don't want to give away too much so others can discover it on their own. This makes it hard to review because it's a compelling story but describing what happens would spoil it. No wonder the solicitation for this issue was so short. "The ongoing mystery series from BRIAN K. VAUGHAN & CLIFF CHIANG charges ahead, as the girls have a close encounter with an unexpected visitor." While it's accurate, it's only part of the story. The mystery continues as people keep disappearing, dinosaurs pound the earth and rule the sky. Another visitor emerges whose motives aren't clear but certainly pose a threat to other new beings roaming the empty streets. Meanwhile, our heroines are racing against time, trying to save a friend in a woodpaneled station wagon. The 80's are alive and well in Vaughan's homage to kids-in-peril adventure movies. Yet, Vaughan does Spielberg one better by putting a group of girls as the protagonists. It's an aspect that's a welcomed change because unlike the movies of the 80's that involved girls, these girls are about unraveling a mystery, fending off possible aliens, and looking out for one another. It's not about boys, falling in love, or appeasing male leads. So far in this story they could be our last line of defense against whatever is causing these incredible events. Chiang's character designs are as immaculate as ever with expressive facial expressions and clothing that is spot on. Matt Wilson drapes the story in ominous grades of purples, violets, and fuschias. It hovers over the town with the right amount of eerieness giving the story a sort of noirish tone dipped in purple instead of black. Obviously, 'Paper Girls' is more than just nostalgia. It's a slow-burning sci-fi story being unfolded with enough moments of surprise and awe to keep the reader riveted and demanding more by the end of it. 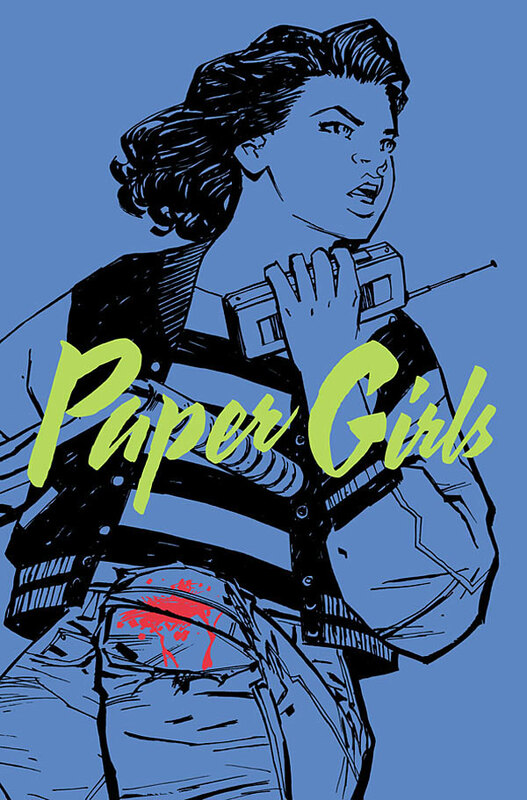 Vaughan and Chiang have captured the wonder and fun of another era that makes 'Paper Girls' a unique and satisfying experience.